Another tablet is getting the newest version of Android, but it’s not one you’d expect. In fact, it’s not even a tablet that was built to run Google’s mobile operating system in the first place. 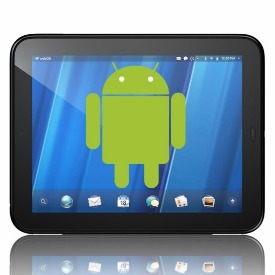 As those without a Nexus 7 $249.99 at Amazon Marketplace or Motorola Xoom await their upgrade to Android 4.1 Jelly Bean, it’s Hewlett-Packard’s discontinued, webOS-based TouchPad $229.00 at Walmart.com that’s getting an unofficial but nevertheless real injection of confectionary Android 4.1 goodness. Before Android tablet users pitch a fit, it’s worth noting that the unofficial port of CyanogenMod 10 (CM10) for the TouchPad put together by XDA Developers member Jcsullins has “plenty of gaps in functionality,” SlashGear reported Friday. That may be a bit of an understatement. “Hardware video and graphics acceleration aren’t functional, and neither is audio. The front-facing camera doesn’t work, and neither does the microphone,” the tech site elaborated after getting a peek at Liliputing’s review of the Jelly Bean port for the TouchPad and accompanying video (below). That’s a lot of functionality gappage, but SlashGear reckoned the CM10 port will improve with time. For now, Jelly Bean for the TouchPad offers decent Web browsing and email, albeit without sound or very good video playback. One issue some users of the mod are reporting is wonky battery charging on their TouchPads, but that doesn’t appear to be the case with all ports… continue reading this article at pcmag.